The Enphase Powerline Carrier uses your structure’s AC electrical lines in place of an ethrenet cable to connect your Enphase ethrenet devices to your network router. it is essential to use two of Enphase's Powerline Carrier to complete an ethernet bridge (This product comes in two peices). Being compatible with the Enphase Envoy Communication Gateway, the Enphase Powerline Carrier is useful when your gateway is placed at a distance from your network router and when wiring an ethernet cable is impracticle due to distance or walls. This Enphase Powerline Carrier is compatible with a standard AC outlet. Aside from a power source, this product requires no additional wiring while transmitting data. Plug the Enphase Powerline Carrier into your AC outlet, connect it to your Enphase Envoy using an ethrenet cord, plug your other Enphase Powerline Carrier into an AC outlet next to your router and connect it to your router. Data is transmitted using broadband Ethernet protocols across the bridge. 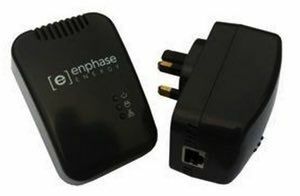 The Enphase Powerline Carrier works with the Enphase Envoy Communications Gateway, Enphase Microinverters and the Enlighten website. The Enphase Powerline Carrier has three LED indicators for power, AC connection, and network connection status. An ethernet cable is also included.